Korean Shabu Shabu, Spicy Please?! In South Korea, meals come in all shapes and sizes but many prefer the wide array of soups to be found throughout the country. Korean Shabu shabu is an example of largely successful yet imported fare enjoyed by the masses. Shabu shabu is Japanese onomatopoeia and characterizes the swirling sound the food makes as it’s placed into the steaming pot. Three courses destroy any notions of lingering hunger one might have upon leaving. We all know the feeling. Some meals just don’t do the trick but not here. Thus, snacking beforehand is not a smart move. To address the spicy question, it’s a no brainer and welcome thanks to years of precedents. Honestly. Some people come to this country with no desire to learn the language, eat the food, or enter the other realms found within Korean culture. And that’s okay. I get it. The pot arrives, filled with a red broth and accompanied by plates of thinly sliced meat and vegetables to get things started. Not all foreigners enjoy everything about Korea. That’s a given, but that well-known Korean pride extends into the kitchen and when a “visitor” turns down an offer of food, people notice and talk. Oh, they talk. Standard icebreakers between locals and visitors will at least include one inquiry about spicy food and whether or not one can use chopsticks. 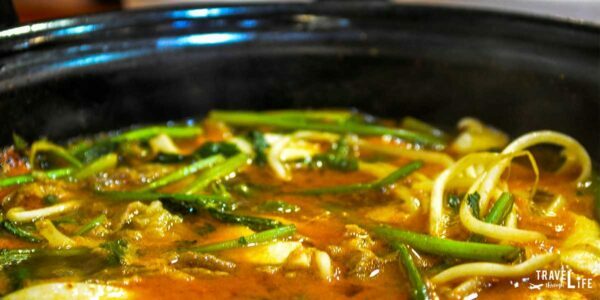 Thick or thin noodles go into the pot to soak up the mixed flavors created from the boiling meat and green veggies. On the former, asking about one’s taste preferences is a prerequisite and neglecting to do so could lead to trouble. People work really hard in kitchens and restaurants to churn out some really tasty food. So in order to avoid yet another “embarrassment” where this country’s guests might not enjoy the culinary experience, the question is valid. My palate is not as bold as the amazingly tough and adventurous Wife, but yes. I like a bit of spice until it reaches that point where each subsequent bite burns away all remaining taste buds. But that’s not Shabu Shabu. Of course, many varieties of this exist in and out of Korea. Originating in China and making its way to Japan in the 20th century, shabu shabu ranks among some of the best food experiences one can have in any setting. The final round is a great finisher but in some cases, tapping out is totally understandable. The staff will ask if it will be necessary once the noodles are gone. When proceeding, some restaurants take the pot away while others will create round three at the table. But one thing is certain. That fried rice is probably the most delicious variety found inside this country. Mixing all those broth flavors with rice and assorted vegetables will soothe even the savagest of souls. There’s nothing better. Shabu shabu satisfies just about any palate and promises an enjoyable culinary event. Even if it’s an import, Koreans love this meal and the culinary experience found inside a Korean Shabu shabu restaurant is hardly replaceable. Basic fare includes a milder version with a simple beef broth but for the more adventurous types, the redder the better. The menu depends on the restaurant but there are quite a few chains that serve a fairly standard recipe. Thanks for the comment, Neysha! I hope you enjoyed reading and the photos. Go get some shabu shabu now! Lol. There are so many Korean foods I have yet to try on account of my vegetarian diet. One question, is the meat usually pork, beef or chicken? There are so many Korean foods I have yet to try on account of my vegetarian diet. Looks like I’ll have something to try out on the next meat night lol. One question, is the meat pork, beef, chicken? Just curious. Generally beef, from what I remember. Not sure if there’s a chicken option to be honest. We used to go out with a person who was veggie as well and we’d just let them get their fill of the veggies before putting the meat in. That’s an option if you’re out with people. I just ate shabu last night! I prefer the vietnamese variety, with the rice paper and veggie rolls and pineapple and peanut sauce!! haha I could go on forever. Even though I like spicy food I also like the beef broth more because I think it suits the flavors a bit better. We recently took my aunt to a shabu restaurant during her visit and I found a caterpillar in my bowl! Eeeek! I discreetly disposed of it because I wanted to make the best impression, but I definitely haven’t forgotten it! Yeah, I like the beef broth as well but the spicy variety just hits the spot more for me. Now I’m getting a bit hungry for some more. Thanks for stopping by! This looks great, where is this restaurant? The one where these photos came from is in Gwangju. The name of it is 등촌(Deung Chon) and honestly, it has my favorite variety of Shabu Shabu. Thanks for stopping by! I am so hungry reading this! I am in LOVE with shabu shabu, but I’ve never had any of the spicy stuff, just the small rice paper rolls. It’s so true… Every Korean I’ve met asks if I like spicy food! I hope you go get some spicy shabu shabu ASAP. It’s on my mind at the moment. NEED IT. I am sitting at school as I read this, about to head for lunch. Now that I am really craving shabu shabu, the poor lunch ladies won’t have any chance of impressing me with their culinary skills. Thanks for the comment there. I hope you’ve been able to eat some in the time it’s taken for me to comment back. Cheers for stopping by! I love this style of shabu-shabu more than the Vietnamese style. I have a restaurant near my house the I visit often. My favorite part of this dish is the rice at the end! With that said, I still find the shabu pot to be a bit more on the spicy side and often ask them to turn down the heat (spice!) otherwise I find myself crying mid-meal lol. Lol. I used to be the same way but just had to toughen up before my wife is really into spicy food. Actually, that’s an understatement. She LIVES for spicy food. Thus, I have to adjust accordingly. Thanks for stopping by! Haha I laughed at your first line. They ALWAYS ask if we like spicy food. I still haven’t had shabu shabu, but it sounds amazing! I’ll have to get myself over to one asap. Lol, Hopefully you’ve gotten to a restaurant by now. If not, get there soon! Thanks for stopping by! I once went out to shabu shabu lunch with a very stubborn woman that had lived in Korea for bit and thought she was a pro at all things Korean. I started cringing when she started throwing the noodles in the pot right away and was explaining how to eat this dish completely wrong (even though there was a video playing on the wall about how to eat it properly). I never think about that, but your post brought back the memory. I love shabu shabu, but I don’t eat it often because it is way too much food and my eyes are so much bigger than my stomach! It’s easy to get caught up in the hoopla and go straight through all 3 rounds without realizing your belly is beyond full. I had a similar experience with a “pro” and wanted to take the tongs away from her. Thanks for the comment! I was MIA for a bit on replying so apologies there.